It wouldn't be E3 if it wasn't for the rumours, speculation and supposed leaks prior to the event. We already knew that Nintendo would be distributing demo units across North America to select Best Buy stores, allowing consumers to try four major upcoming Wii U titles. Last weekend, we reported that a supposed list of the four games had made its way online, including New Super Luigi U, Pikmin 3, The Wonderful 101 and The Legend of Zelda: Wind Waker HD. This list couldn't have been more far off - well, except for Wind Waker HD. Yes, that's right, the upcoming GameCube remake will be available to try out across 100 select Best Buy stores, along with the newly announced Wii U titles - Mario Kart 8, Super Mario 3D World and Donkey Kong Country: Tropical Freeze. 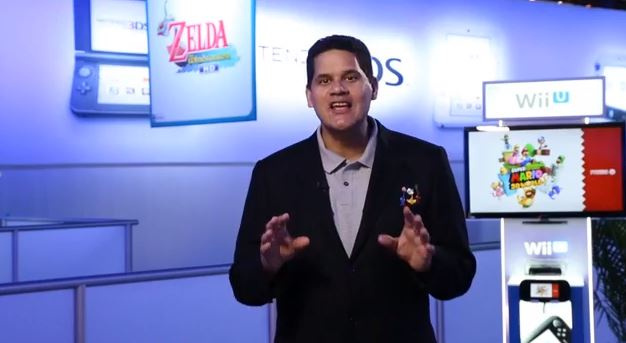 Reggie Fils-Aime's full announcement is below. When will the demos be playable? Unfortunately, the nearest Best Buy is like two hours away from me. So pumped! Cant wait, cant wait, cant wait!!!!!!!!!!!!!!!!!!!!!!!!!!!!!!!!!!!!!!!!!!! Dang i was hoping for a luigi grab bag or at least smash bros.
Great. Hopefully Nintendo will host similar opportunities to try out the games in Europe as well. Well, it looks like I'm taking a trip to Portland tomorrow. I knew it! That Other list was bunkum! All those who are complaining, I'm more than happy if you send the demo Wii U over here to the UK. I'd love to try ALL of the games on offer. Hmm... There's only one Best Buy in my state that will have this, and it happens to be the one about 3 miles from my office. I think I might have to drop in. So much for that leak being fake. Good thing that stupid rumor was false. Well so much for 100% correct on the 75% incorrect rumour. Better list though. Should have added into into the ND. Actually these should just be in all stores all the time. They're demos. And Nintendo still needs to sell WiiUs. Gonna try out Mario Kart 8 & Donkey Kong Tropical Freeze. How about sending Wii U owners these demos via eshop because we've patiently waited for months without any games.? Wow, that list of demos is much better than that supposed list that "leaked" online a few days ago. I even read on another site that the list had been "confirmed" by "inside sources." Ha. @Nintenjoe64 Exactly. What is the point of making things inconvenient for their most loyal fanbase when they don't have to? If they don't put these demos up very soon on the eShop, I will be voicing my complaints to them in every way possible. I've said this before, but it's worth repeating: It would be stupid for them to NOT put these demos on the eShop. MARIO KART 8! MARIO KART 8! MARIO KART 8! BEST BUY HERE I COME!!! Will someone please record the gameplay footage and put it on YouTube? Such a shame that, for me, the closest participating Best Buy is so far away.